Later the same day as the healer came to work on Scott, we were sitting together on a couch in the magnificent central lobby of the Taj. This is a grand space with many seating areas and a great place to people watch. I noticed a local man across the lobby staring at us and I caught his eye. Surprisingly he came over to us and asked me to walk back across the room to see why he was looking at us. I followed him, sat down, and immediately saw that the perspective and angle made it look like a flame was coming out of Scott’s crown chakra ( top of his head) and gave a halo effect. The man said mine was doing the same when I was seated next to Scott. The explanation? Two pillar candles placed on a table behind us on the couch that were completely hidden by our heads. Plus there was a statue of Shiva within a mandala between the candles/ our heads! I told the man our story of marley & miracles and he was delighted. 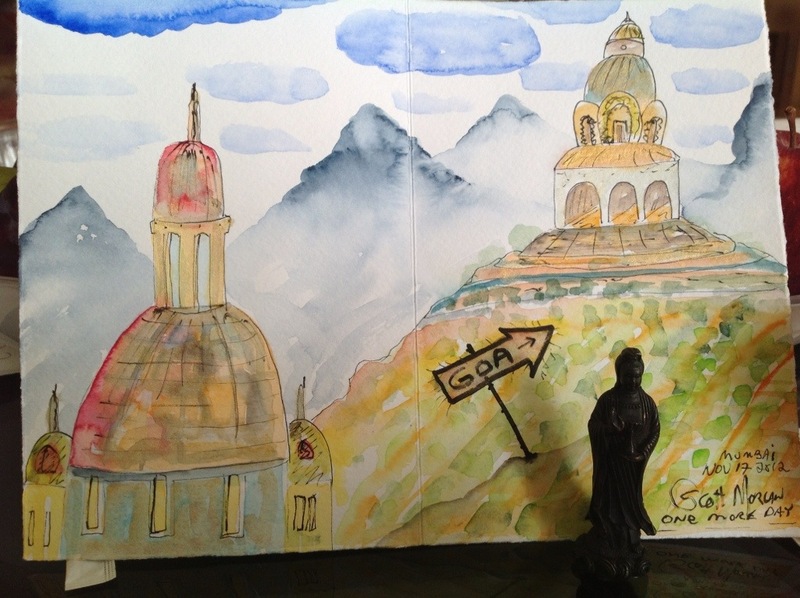 Our new friend shared a valuable contact in Goa with us, too. This entry was posted in Uncategorized and tagged art, crown chakra, going to oa blog, Scott morgan painting, synchronicity, taj mumbai hotel. Bookmark the permalink.